In a competitive and highly regulated industry, even well- established companies need to keep on upping their game. Tican Chilled, with their roots dating back to 1928, are a market-leading wholesaler serving the UK with a comprehensive range of high quality beef,lamb, pork, poultry and bacon products exclusively selected to fulfill each and every individual customer’s needs. They appreciate the importance of continually enhancing the quality of their service. Following recent events in the meat transport industry, Tican Chilled were looking to ensure that their cold chain was fully robust, with all product delivered at or below 3°C, whilst enhancing their capacity to prove their temperature compliance. They decided to trial the Transcan Advance and Seven Eye technology from Seven Telematics. This technology combines telematics and temperature monitoring and logging. Made in Britain, the Transcan Advance is the world’s most widely used road transport temperature monitoring device. The trial has been such a great success that Tican Chilled has made the Seven Telematics technology a permanent addition to its fleet.The Transcan Advance will enhance the nine new vehicles that they have just added to their 27-strongfleet. 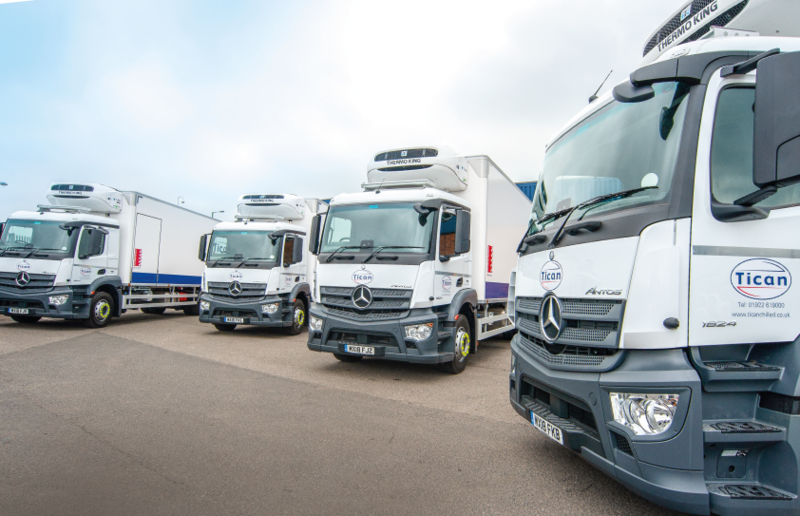 These are Mercedes Benz trucks supplied by S&B Commercials, with refrigeration by TK and bodywork by Chereau, with the vehicles contract hired in by Ryder. “We ran the trial for two months in one vehicle. With the Seven Telematics system, we found that we could keep a much closer eye on our fridges and temperature levels, at all times. We have a multi-drop system, so the lorry door is opened and closed several times during a journey. Having a sensor on the rear door linked up to an alarm system proved to be hugely valuable in allowing us to ensure that multiple door openings do not compromise the quality of the meat that we deliver.